Luciano Pavarotti’s repertoire comprised only a few roles, but his performances and recordings of them wrote and rewrote history. Pavarotti’s Riccardo (Gustavo III) in Verdi’s Un ballo in maschera in his studio recording of 1983 is given pride of place because of its surface brilliance (not least thanks to Georg Solti on the podium); in his live TV broadcast of the same role three years later under Claudio Abbado he offers a striking sense of musical and dramatic immediacy. 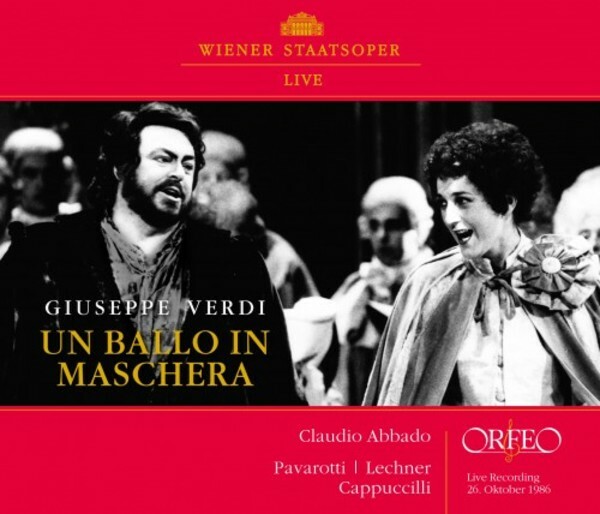 In this recording of that broadcast from the Vienna State Opera, we can hear a performance both highly nuanced and possessed of an immense radiance, from his very first “Amici mei” to his touching death scene. After the famous canzona in the first act of this recording (“Di’ tu se fedele il flutto m’aspetta”), the audience of the Vienna State Opera justifiably burst into a storm of applause (and not for the last time either). As in the studio recording with Pavarotti and Solti, the role of Amelia was sung by Margaret Price on the opening night of this production. In the second performance, the then 25-year-old Gabriele Lechner had to stand in for her – and she did so not just with an overwhelming, fiery, youthful vigour, but also with astonishing luminosity and conviction. Just listen to the opening of the second act when Amelia waits fearfully for her beloved Riccardo alone at night – and then finally meets him. It’s rare to experience such a truthful performance as this. But the Russian mezzosoprano Ludmila Semtschuk as the fortune-teller Ulrica is also beguiling with her passion and profound depth. Piero Cappuccilli had been well known to the Vienna audience for decades. He too is unmistakeable in his timbre and his art of musical characterisation. Like many famous Verdi baritones he was not free of vanity, but this has no adverse impact on his performance as the jealous husband of Amelia and the friend of Riccardo. Claudio Abbado had been the new music director of the State Opera since the autumn of 1986. He had given his highly successful debut there just two years earlier. As ever – and not just with Verdi – Abbado is convincing here in his insistence on a lean, sinewy, tense performance from the Vienna Philharmonic, and this is wholly in the interests of the musical drama.